Africa; Economic Anthropology; Film Studies; Gender Studies, Human Rights; Immigration and Refugee Studies. African immigrants in Maine, especially economic, employment, and resource allocation issues; impact of economic ‘development’ on urban and rural populations, especially its effects on gender relations; political mobilization of African market women; representations of Africa and Africans in various film and video industries. 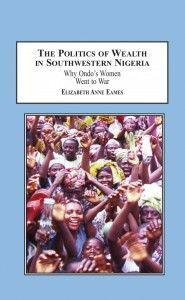 My latest book: The Politics of Wealth in Southwestern Nigeria: Why Ondo’s Women Went to War.